The list (pdf file) published by NA 172 Normenausschuss Grundlagen des Umweltschutzes(NAGUS)- German Federal Environment Agency can be downloaded if you visit the site here. Viewing the list, we found it rather eye opening that the companies listed are from wide variety of business sectors with mixture of small to large energy users. According to our observation, the certified company increased from 1,041 in January to 1,247 and the certified sites 1,475 to 2,016. This increase is significant however it should be noted largely owing to the performance of Germany. Germany continues to demonstrate the leading role with a wide margin. Our observation learning from our friends in Germany is that Germany pursues productivity drive through energy management to maximise the use of renewable and alternative energy under the circumstances of high energy cost and phasing out of nuclear energy. We could sense the heat in Germany as my German friend says still going much too slow. If it is too slow in Germany, how should the rest of the world react? 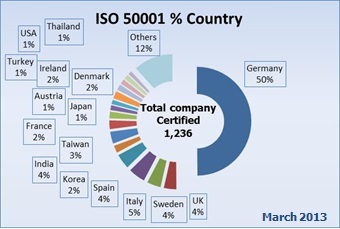 closely about the German ISO 50001 EnMS trend since the two nations share similar energy situation. 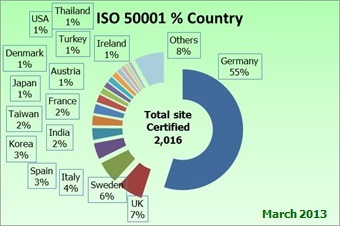 The significant certified site increase is largely due to Hessenwasser GmbH & Co. KG, Germany from 2 locations to 110 locations. Other noticeable movement includes, the total business consulting & service firm Pricewaterhouse Coopers LLP, UK has increased their site certification from 3 to 34 sites. 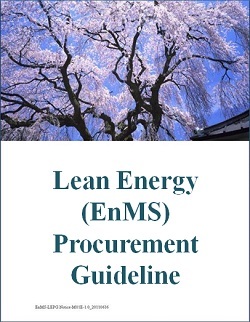 This demonstrates ISO 50001 EnMS is recognised as business issue. Other active firms to be mentioned in the last two months period: AGA Gas AB, Sweden has increase their certified site from 1 to 23 sites. Northstone Ltd. Materials Division, UK has increased their certified site from 1 to 22 sites. West Coast Trains Ltd., UK has their certified site from 1 to 17 sites. Cementa AB, Sweden is the newly certified firm covering 19 sites. EnMS-Doc would like to keep a close eye on the information update, and exchanging information with you.